Altering the genetic code in humans has long been a staple of science fiction, just as it's represented an important goal for biomedicine. Until recently, making targeted changes to the genomes of living cells was not really feasible, at least at large scale. The available techniques for genome editing required custom-engineered proteins that were laborious and time-consuming to produce. That changed with the development of the CRISPR/Cas9 system, which allows targeted, precise changes to the DNA of living cells. Like many of our tools for DNA manipulation, this one originated in bacteria. In 1987, researchers studying E. coli noticed a strange pattern near the end of one of the bacteria's genes. It was a DNA sequence immediately followed by its mirror image (the same sequence in reverse), then about 30 non-repetitive bases, and then the palindromic structure again. Over the next two decades, this pattern—called clustered, regularly interspaced, short palindromic repeats or "CRISPRs"—was observed in many other types of bacteria (more than 40 percent of all species). The function of CRISPRs remained a mystery until 2005, when three independent research groups noticed that the 30 bases of "spacers" between palindromic repeats matched the sequence of certain bacteria-invading viruses called phages. CRISPRs encode RNA molecules that help guide DNA-cleaving enzymes called CRISPR-associated (Cas) proteins. Together, they form a sort of adaptive immune system. When a phage invades, the bacteria incorporate small portions of the invading DNA as spacers in CRISPR structures. The RNAs produced by these structures partner up with Cas enzymes to identify and destroy the invader's genome. The Cas9 protein of Streptococcus pyogenes can cleave nearly any DNA sequence complimentary to its guide RNA. With some modification, the enzyme can instead change the genome sequence in a precise manner. The power of this system is in its simplicity: by modifying the sequence of the guide RNA—which is much, much easier than modifying a protein structure—we can alter the genome of living cells with surgical precision. And those cells don't have to be bacteria: CRISPR/Cas9 works just as well in plants and animals. 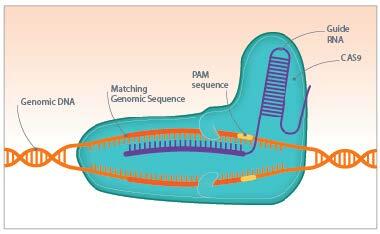 Image: Nature Publishing Group: John van der Oost, et al, Nature Reviews Microbiology 12, 479–492 (2014). Reprinted by permission. 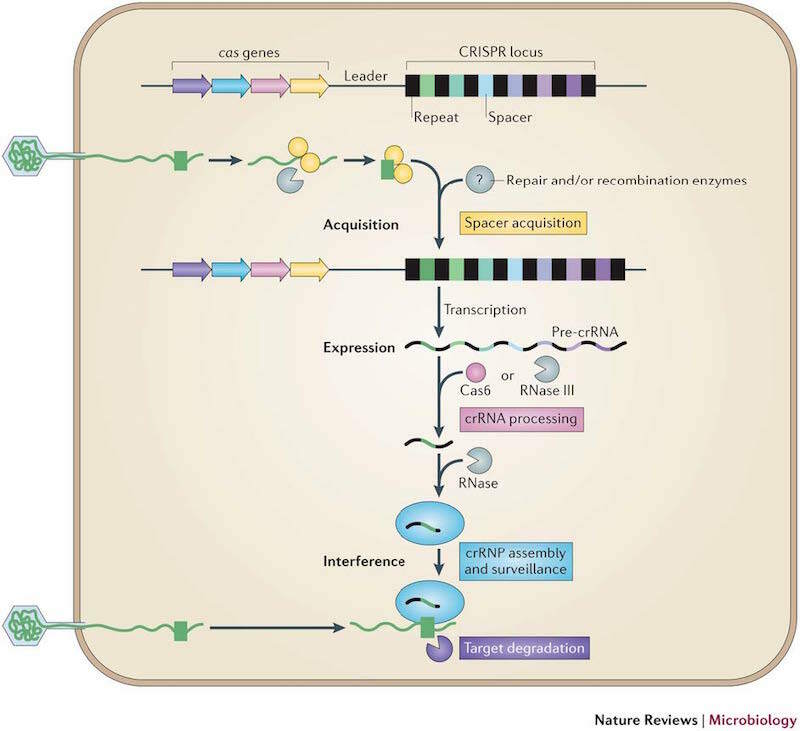 Simple and precise genome engineering with CRISPR/Cas9 opens a realm of possibilities. Animal models of human disease are perhaps the best place to start. Every person has about 3 million genetic variants compared to the human genome reference, so it's often difficult to identify which ones contribute to disease. With this system, we can introduce candidate mutations into a laboratory animal, such as a mouse, to determine if it results in a similar disease. Once we identify the disease-causing mutation(s), such laboratory animals can become the front line for testing possible treatments. And because Cas9 can be given many different editing "targets" at the same time, we could even introduce several genetic changes at once to model complex diseases like diabetes and heart disease. Another application of CRISPR/Cas9, and one that I'm personally very excited about, is functional screens of genetic changes in living cells. A simple but not widely understood fact is that, while we know the location and sequence of most of the ~20,000 genes in the human genome, we have no idea what many of them do. One way to study gene function is to disrupt or alter its sequence in cell lines or model organisms. CRISPR/Cas9 offers a way to do that with some precision. In essence, we can learn about how the genome works by inducing specific changes and measuring the effect they have on a cell. The potential applications go well beyond research. Genome editing should make it easier to develop better crops and healthier animal stock, and probably even customized pets (no, it won't make your cat pay more attention to you . . . some things are just too ingrained). That's all good news for the research community, but let's be honest: the truly exciting applications for this technology involve editing human genomes. First up: correcting the underlying defect in severe genetic disorders like cystic fibrosis, sickle-cell disease, and Huntington's disease. The appeal here is that such diseases are typically caused by defects in a single gene. Correcting that defect in a patient, if we can manage to do it in the relevant tissues, might offer a permanent cure for many such diseases. Image: Horizon Discovery Group. Used by permission. Another way CRISPR/Cas9 might improve human health is in the defense against infectious diseases. Researchers have already demonstrated that it can be used to protect human cells from infection by viruses like Hepatitis C, which implies that we might be able to use it to boost immunity to dangerous pathogens. It's not yet an immediate cure for human viral infections, but it still offers a glimmer of hope for patients suffering from chronic viral infections by herpesvirus (fever blisters), HIV (AIDS), varicella zoster (shingles), and others. By the time we're born, our body comprises millions of individual cells, each with their own copy of the genome. Correcting a genetic defect in all of them is destined to be a difficult and inefficient process. But if the CRISPR/Cas9 system were paired with another technology—in vitro fertilization (IVF)—would allow us to make changes to germ cells (sperm and eggs) or human embryos prior to implantation. Most people would agree that using genome editing to correct the underlying defect in patients with severe genetic diseases—like cystic fibrosis or sickle-cell anemia—is a good thing. But as our knowledge of the human genome grows, the possibilities go far beyond that. Right now in 2015, we know mutations that lower cholesterol, protect against HIV infection, and reduce the risk of Alzheimer's disease. Then again, we also know mutations that affect hair color or eye color. There's even one that boosts your chances of making it as a world-class sprinter. As long as we're addressing health risks, is it all right to confer some of those traits as well? The movie Gattaca (1997) portrays a society in which most parents employ genetic manipulation technologies to conceive children with the best possible hereditary traits. These designer babies grow up and get all the cool jobs because they're genetically "superior" in nearly every possible way. The children conceived without such manipulations are considered inferior, and are basically destined to live out their lives as janitors or trash collectors. Gattaca portrays a future that seems both distant and unlikely, but a technology that allows us to edit the genomes of human embryos brings it into the realm of possibility. As appealing as it may be to think about all of the good things we might do with CRISPR/Cas9, we still don't know enough about the potential long-term risks of human genome engineering. In the past, technologies developed to correct genetic defects have had off-target effects. Early clinical trials of gene therapy with recombinant viruses, for example, were halted after some participants developed leukemia. And changes made to a human embryo can be passed on to children, which means that they could have unforeseen effects in future generations. The beta hemoglobin gene (abbreviated HBB) offers a useful example. 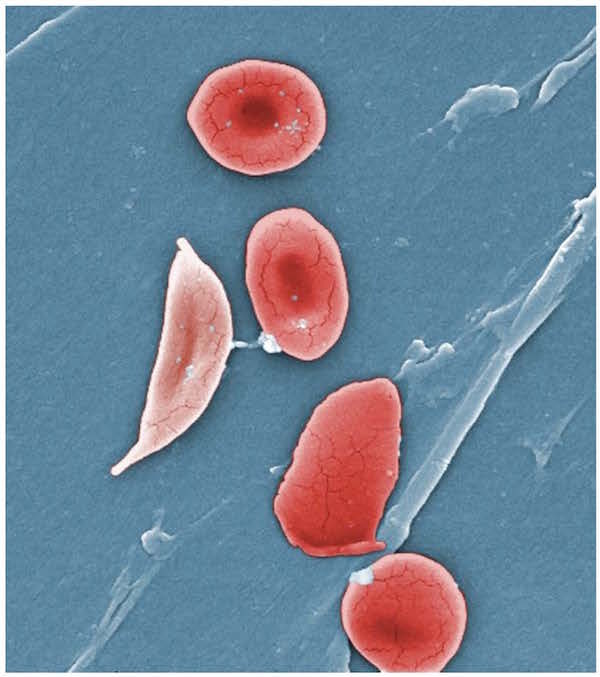 Severe mutations in HBB cause sickle cell disease in autosomal-recessive fashion, meaning that a person must inherit two mutated copies of the gene to get the disease. It would be tempting, therefore, to use CRISPR/Cas9 to reverse the disruptive mutation in the germ cells of known mutation carriers. Yet individuals with just a single mutated copy of HBB are naturally resistant to malaria, a major cause of morbidity and death in Africa. This "carrier advantage" helps explain why severe disease-causing mutations persist in African populations at frequencies higher than we'd expect. If we used CRISPR/Cas9 to systematically remove HBB mutations, we could almost certainly reduce or eliminate sickle cell disease . . . but future generations might be more susceptible to malaria. Image: sickle cells, Creative Commons (CC BY). Thus, there are both ethical and safety considerations that must be addressed before we plunge whole-hog into human genome engineering. Mindful of this, an international group of scientists proposed a moratorium against conducting "genome surgery" on human cells. But a voluntary moratorium is not enough to prevent this research from happening, especially in countries who haven't agreed to it. That became apparent earlier this year, when a research team in China used the technique to modify the genomes of human embryos. They used "non-viable" embryos from a local fertility clinic, and hoped to employ CRISPR/Cas9 to alter the gene for β-thalassaemia, a severe blood disorder. The results of the study were disappointing and the journal that published it is rather obscure, but that's the smaller problem. The larger one is that Chinese scientists were able to do this and get it published, with virtually no oversight from any outside authority. The only positive outcome from the study is that it sounded an alarm bell for the medical and research communities. Human genome engineering is coming, whether we like it or not. As a science fiction author, I think it's exciting. As a scientist, I also think it's a little terrifying. We have only begun to debate the ethics and morality of altering our own genetic code. With great power comes great responsibility, and we've never had more genetic power than we do right now. Dan Koboldt is a genetics researcher with more than 60 publications in Nature, Science, The New England Journal of Medicine, and other journals. He works at an NIH-funded genome sequencing center, where he and his colleagues use next-generation DNA sequencing technologies to uncover the genetic basis of inherited diseases such as age-related macular degeneration, heart disease, cancer, and diabetes. Dan also writes science fiction and fantasy. His debut novel The Rogue Retrieval, about a Vegas magician who infiltrates a pristine medieval world, is out from Harper Voyager. His web site can be found here.